Explorers! 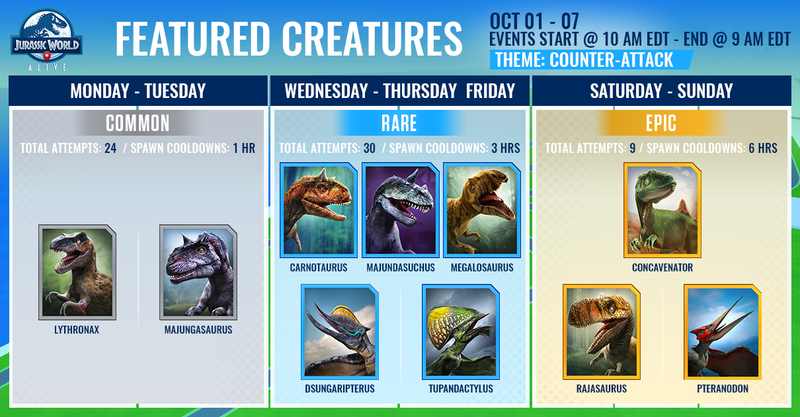 Ludia has officially announced Week #18’s list of featured dinosaurs! This week will still feature a few “birds” (in case you missed any these last two weeks…) But also features other dinos with a Counter Attack Theme! With the new tournament starting up and everyone fighting their way up through the arenas, it never hurts to have some good Counter Attack Dino’s on your team! For the Rares, Megalosaurus seems like an obvious pick, it is an ingredient for Megalosuchus after all, but if you do think you have enough Megalosaurus DNA, Dsungaripterus might seem like a Dino you would want to go after too, solely due to the nature that it isn’t a Dino that spawns in the wild at all. One Dino we’d advise you steer clear from, however, is Majundasuchus, since it isn’t the most optimal way to use Magundasuchus DNA. The optimal way to treat Magundasuchus DNA and other rare hybrid DNA is to fuse for them, since they aren’t hard to gather and give the best EXP/Coin outcome. For the Epics, Rajasaurus seems like the obvious choice here. While Raja is a good Alpha tier dino all on its own, it also fuses to become the Apex Rajakylosaurus and eventually leads to the sought after Apex Diorajasaur! Unfortunately, Raja is not usually the hold up in obtaining these Apex Dinos, as we never seem to have enough Ankylosaurus to fuse all that we want to fuse! Concavenator is a good specialist dino but does not have any hybrids and is also one of the more common Epic dino’s to find in the wild. While Pteranodon is a decent specialist, we have seen quite a lot of it flying around this week in our strike events, and it also does not currently have any hybrids. RECAP: How Do Featured Dinosaurs Work? 1. You have a set number of hours to collect DNA from the Featured Dinos, as indicated on the Special Event Supply Drop once you open them. 2. Cycles always begin at 10:00 a.m. EDT and last for however many days indicated by Ludia. 4. During the given time period, there will be anywhere from 1-5 different Featured Dinos and you will have a combined number of attempts for the Dinosaurs together! For example, If Ludia gives us two common dinos to choose between, you will have 24 attempts. If you need more of Dino A DNA then Dino B DNA, Do more attempts on Dino A! Or vice versa! Once again this is not the most exciting week, but there are perhaps a few certain dinos that you have been looking for, and now is your chance! Never a bad idea to have a Counter Attack Dino on your team! What do you think about this week? Which Dinos will you be darting? Follow us on Twitter and Facebook for all the latest Jurassic World Alive News and join the discussion on our Discord! Heyy boonslevin…I am missing discord…let me in….it was so lively in there. Do not underestimate Lythronax! I can’t tell you how many battles mine has won, at L20 it’s got enough bulk and bite to pull off some surprises. The only reason I don’t use Concavenator is because it has much less HP and can’t take a hit as well. Spending 138,000 coins to level up Lythronax to L20? Hmm… Doesn’t sound like a really good deal, assuming that it does not have a hybrid (yet). Overleveled dinos are always op. I got destroyed by level 22 apatosaurus today. Actually, I have not ever seen a Concavenatorin the wild. The only DNA I have for this was from an incubator from a few months ago. Must be a regional thing. I have occasional spawns of Concavenator around my house in Local 1 with a frequency of about once in 2-3 weeks, always during the night time. My place have tons….useless creature…. Yeah, I’ve fought them before and they seemed pretty underpowered. Just thought it interesting that they said it was the most common epic, yet I have never seen one in the wild. Finally a good week again, I’ll be able to get my rajakylosaurus and megalosuchus now. I got some weird (bad)luck with DNA. I got enough Irritator DNA but always lack Pyroraptor to level Pyrritator (and before that to just even get it in the first place). Truly glad we got three epics so there will be nice number of attempts. For Rares in my region I see Pterosaurs again (30 attempts). Anyone got info about that?